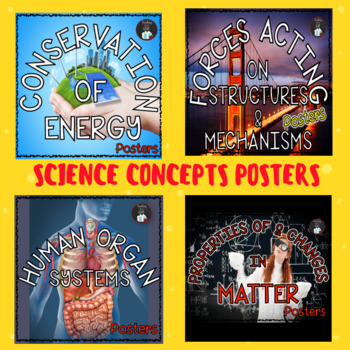 A complete set of SCIENCE CONCEPTS POSTERS based on my popular ONTARIO SCIENCE: GRADE 5 ILLUSTRATED WORD WALL MEGA BUNDLE to help support the teaching of the Ontario Curriculum for Science and Technology in Grade 5. INCLUDES HUMAN ORGAN SYSTEMS, PROPERTIES OF AND CHANGES IN MATTER, FORCES ACTING ON STRUCTURES AND MECHANISMS AND CONSERVATION OF ENERGY. PLEASE SEE INDIVIDUAL PREVIEWS TO FIND OUT WHAT IS INCLUDED IN EACH SET OF 8 1/2 BY 11 POSTERS.